With all the Las Vegas Hotel options to choose from, most with a vibrant pool scene, it is difficult to decide where to land. However, the Flamingo is known for some excellent pool options. Flamingo Beach Club Pool is set apart from the over 18 pool so it is perfect for families looking to separate themselves from the typical Vegas craziness. The pool is large enough for kids to cannonball and not be too much of a nuisance. Kids will also not have to worry too much about splashing some high-strung adult holding a beer bottle. If you are in this pool, you have signed on to the chaos that kids create. The slide works well to keep the kids entertained if you feel like enjoying a cocktail while they get wet. If you're a fan of sliding into an abyss not knowing if you will plow into a kid they allow adults on the slide. The pool is open from 8 a.m. to 6 p.m. with the slide opening at 10 a.m. There are height restrictions on the slide, so your child might need you to ride with them on the larger slide. There is a smaller slide that is a good introduction to water slides for the smaller children. The Flamingo Hotel is set up just right for an affordable family vacation. You get good food options, family-friendly entertainment, a pool just for families and a location that makes it easy to walk to plenty of the family-friendly attractions. Cabanas are available at the Flamingo Beach Club pool, and they do aid in keeping you out of the sun for the in between periods. The cabanas have a ceiling fan, misters, a small refrigerator and a giant flat screen television. You'll also get very attentive service as well as the opportunity to lounge on the couch with a view of the pool. Two chaise lounges are included as well as complimentary water and a fruit bowl. If you go VIP cabana, you also get a bottle of liquor. Nearby at LINQ Las Vegas, there are plenty of family-friendly restaurants and things to see. The Flamingo Go Pool is the spot for the resort's 18 and over guests. That is correct...there are no kids splashing chlorine into your drink, and when you stumble, you can be sure that you will not be jamming some kids head into a lounge chair. The music is loud, the atmosphere is pure Las Vegas party, and the drinks seem to flow from everywhere. You can play blackjack, order BBQ, or just lounge in daybed or a cabana. If you seek bottle service, you can sit around mixing your own drink for a premium price or just buy buckets of beer. 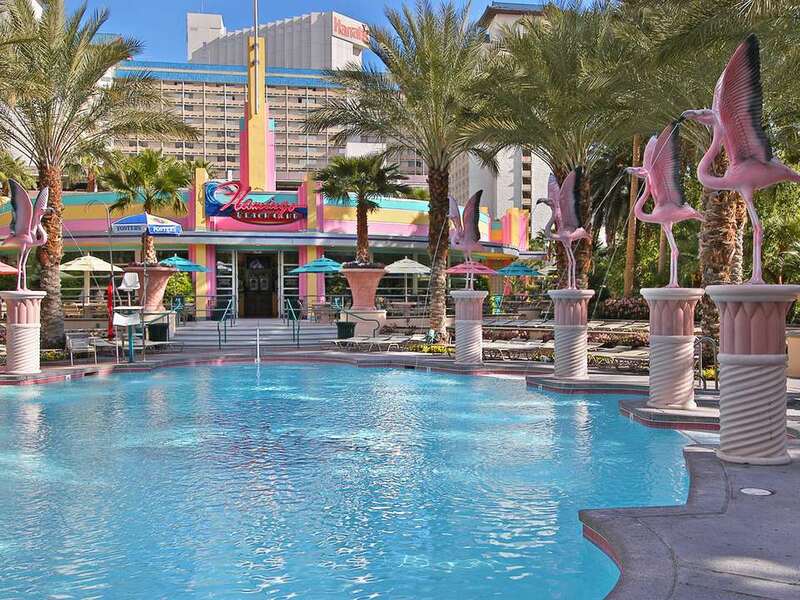 The Flamingo GO Pool is open from 8 a.m. to 6 p.m., and has a live DJ most of the day. There are special events planned that usually include some form of alcohol, and a few pretty people enticing you to have more fun.